Every organic life form starts from a single cell. Cells form a tissue, tissues form an organ and organs form a human being. These cell divisions by which a single cell divides into hundred trillion times is a process called growth. It is a unique intricate process that happens in the body. A normal cell follows a uniform life cycle and reproduction. The question now is why is there abnormal cell growths? Abnormal or mutant cells are cancer cells. This happens when a certain cell DNA gets a different signal that causes mutation. Normally, when a cell senses a mistake, it self-destructs or the system eliminates it from the body. But, there are some instances that cell mutation are left undetected, and these cells reproduce and grow erratically, hence the growth of cancers cells. Cancer cells vary from normal cells. Both have different characteristics that allowed researchers to understand cell mutation extensively. From these, development of therapies and treatments are designed to try to eliminate cancer cells without destructing normal cells. Normal cells carry characteristics that are essential for normal body functions. These cells have different in shapes and sizes but are uniform depending on what type they are. Human cells are Eukaryotic because they contain true nucleus that contains genetic information – DNA (deoxyribonucleic acid) and RNA (ribonucleic acid). These genes are responsible for all cellular activities and functioning. Healthy cells divide in an orderly manner to produce more cells only when the body needs them. They follow a life cycle which includes mitosis and meiosis, and cell death – apoptosis. There are 2 distinct features that cancer cells have: cell growth not regulated by external signals and the capacity to invade tissue and colonize distant sites. The uncontrolled growth of abnormal cells is a property of all neoplasms. Neoplasms can either be benign or malignant. What’s the Difference between Benign and Malignant Neoplasm? Benign neoplasm is abnormal cell growths that are non-cancerous. They do not invade or other parts of the body. This can be removed surgically and it is not life threatening. These cell growths are cancerous that invades and destruct other tissue and organs. They can travel through the blood stream and the lymphatic system to form new tumors in other part of the body. A process is known as metastasis. The nucleuses have irregular structure and have relatively small cytoplasm. Cells stop dividing when too much of its kind are present. These cells grow and divide in a controlled manner and follow a predictable life cycle. Normal cells undergo the process of apoptosis – self destruction if they detect abnormalities and damage in their organelles. Normal cells communicate with each other for proper functioning. These cells have external membranes that allow them to bond with other cells. 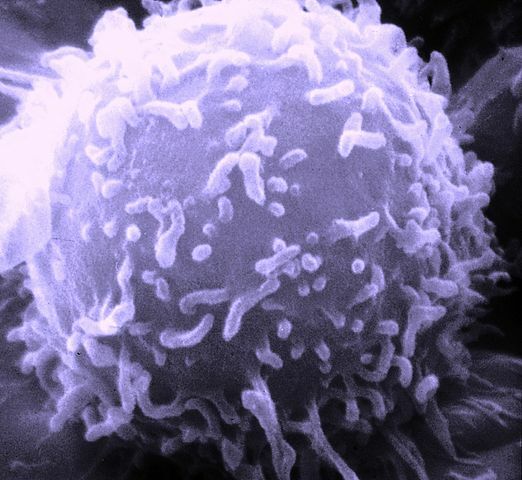 Cancer cells lose the molecules that keep cells bonded together. These cells have the ability to invade or spread to other parts of the body by travelling through the blood stream or the lymphatic system – metastasis. Normal cells start out as immature cells and mature with certain specialized functions. Cancer cells do not mature, and undergo apoptosis. Instead these cells become immature overtime. Cancer cells are primitive and they don’t have specialized functions. Normal cells recognize signals. They know when there are enough new cells and stops dividing. Cancer cells don’t recognize signals. Hence these cells erratically reproduce mutated cells. de. "The Difference between Cancer Cells and Normal Cells." DifferenceBetween.net. January 31, 2015 < http://www.differencebetween.net/science/health/the-difference-between-cancer-cells-and-normal-cells/ >.